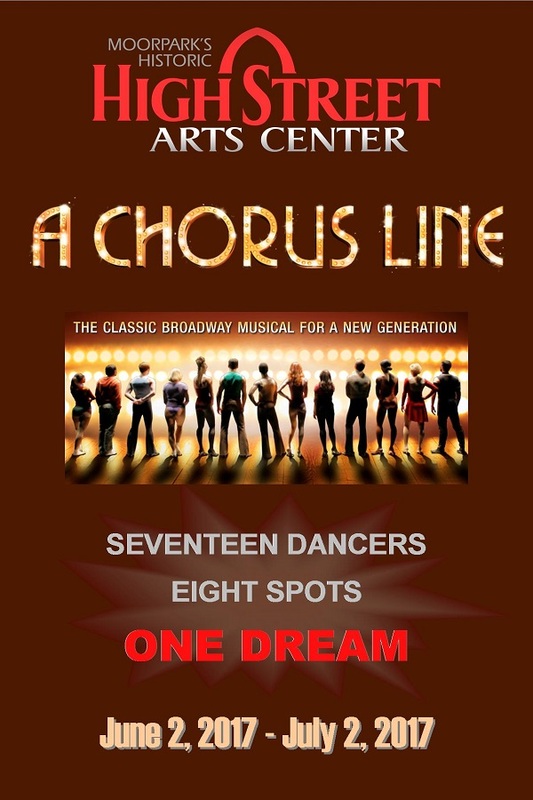 A Chorus Line examines a day in the life of seventeen Broadway dancers, all vying for a spot in the “chorus line” of a new musical. The director asks each dancer to talk about themselves. Discomfort opens into revelation, confession leads to redemption, and within the bright, outwardly homogenous chorus, the audience begins to see each dancer’s individuality. A CHORUS LINE CONTAINS MATURE LANGUAGE AND CONTENT. RECOMMENDED MATURE AUDIENCES. ABEL ALDERETE (Mark Anthony) is delighted to be in his first show at High Street Arts Center. He recently appeared in Rubicon Theatre’s production of In the Heights (Piragua Guy) — as well as in Conejo Players Theatre’s productions of Side Show (Buddy Foster) and Reefer Madness. Other credits include: Rubicon’s West Side Story (Chino), The Drowsy Chaperone (George), and Godspell. He would like to thank his family, friends, and Rita for supporting him in all his endeavors. JESSICA BELL (Kristine Ulrich-DeLuca) is ecstatic to be in her fourth community theatre production! She has been taking professional singing lessons since 2012, and has appeared in Beauty and the Beast (Babette) here at High Street Arts Center; James and the Giant Peach, Jr. (Aunt Spiker) at Conejo Players Theatre; Rodgers and Hammerstein’s Cinderella (Cinderella); and Legally Blonde (Elle Woods) … and she is so happy to add Kristine to that list! MARY ALICE BRADY (Sheila Bryant) is honored and excited to perform as Sheila in this dream of a show! You last saw her perform at High Street Arts Center in Beauty and the Beast (Aristocratic Lady), Footloose (Ethel McCormack), Oliver! (Widow Corney), and Guys and Dolls (Gen. Cartwright). She also enjoys directing and choreographing for the junior musicals at HSAC; she just directed the Spring Showcase, and will choreograph The Lion King, Jr. this summer! So much thanks to Chris, Megan, Kendyl, and her amazing husband DJ for this opportunity! When Mary Alice is not acting, she is a very busy Realtor with Aviara Real Estate in Westlake Village. Enjoy the dance shenanigans! TAYLOR BROWN (Val Clark) is so excited for her first role with High Street Arts Center! Taylor’s most recent credits include Panic! Productions’ Bring It On (Ensemble/Dance Captain). Taylor has trained as a dancer and singer for more than 14 years. She’d like to thank her family, Becca Peyton, Maggie Danielson, and Lauren Wilkins (CAPA) for the training, and for instilling in her a love of musical theater. Next year, Taylor will be attending Chicago College of Performing Arts pursuing a BFA in Musical Theatre. KYLE BUCHANAN-PRESCOTT (Paul San Marco) is an aspiring actor/director and is excited to be back at High Street Arts Center after a hiatus. He is very appreciative of his supportive friends and family, as well as the directing staff for giving him this wonderful opportunity. ANDY CARRILLO (Larry) is a Los Angeles-based dancer. He started off at Moorpark College two years ago and has been a part of several dance productions. Andy has trained in various genres of dance including ballet, hip hop, modern, improv, and jazz. His most recent work includes Motion Flux: Of Beasts and Beauty at Moorpark College and The Señorita Dance at El Camino College for ACDA. He is very excited to be playing Larry in A Chorus Line for High Street Arts Center. HARRY CHO (Don Kerr) is thrilled to participate in his first production with High Street Arts Center. Most recently, Harry appeared in Hair (Berger) at Moorpark College. This is the first show he’s been cast in that involves intensive dancing … although not as experienced, he continues to put in the effort to succeed and believes he has what it takes to make this the best show possible. He dedicates his performance to his wonderful girlfriend Mia, as well as his family and friends. Thank you! MIKE CLARIDGE (Richie Walters) currently attends Moorpark College and will be transferring to UCLA in Fall 2018 to major in Film Production. Michael recently performed in Ragtime at the Simi Valley Cultural Arts Center. In his spare time, Michael has worked as Director and Production Assistant for Grace Brethren’s Youth Theater Program and has acted in various short films including Daze Thru Time and Thru Thin Walls. He would like to thank his family for their incredible support throughout this process. JACK CLEARY (Bobby Mills) is so excited to return to the High Street Arts Center stage! Jack is 19 years old and studies Theatre at Moorpark College. He has been in a number of shows and played many characters, including Willard Hewitt in Footloose, Raoul in The Phantom of the Opera (Raoul), and Lefou in Beauty and the Beast. Jack would like to thank all his family and friends, especially his amazing mom, who is his biggest supporter — and he is so happy she gets to see him in her favorite musical! Enjoy the show! RENEE DELGADO (Sheila Bryant) is honored to be a part of yet another amazing show with an extremely talented cast and production staff! She was previously seen a few years ago at High Street Arts Center in The Producers — and has also appeared in Spamalot, Thoroughly Modern Millie, Follies, and Side Show at Conejo Players Theatre. She’d like to thank her husband, Jason, for always being supportive. When Renee is not on stage, she is a local Realtor. KATE FRUEHLING (Connie MacKenzie) is very excited to be performing with High Street Arts Center for the first time! She currently attends Moorpark College and would like to pursue a degree in theatre education. She has performed with Young Artists Ensemble since she was 10 years old. She also attended Idyllwild Arts Academy Summer Program for four years. Favorite roles include: Sue Snell in Carrie, Wednesday in The Addams Family, and Brooke in Legally Blonde. Kate would like to thank her parents for always being supportive of her dreams. JESSICA GONZALES (Bebe Benzenheimer) is ecstatic to be a part of High Street Arts Center’s production of A Chorus Line. Jessica has been doing theatre since she was 8 years old. She’s appeared in many productions, including Bye Bye Birdie (Ursula Merkle), The Phantom of the Opera (Madame Giry), and Grease (Sandy Dumbrowski). She’s also been a counselor for the previous three HSAC Junior camps, and will be the choreographer for The Lion King, Jr. this summer. Now in her first year of college, she has decided to double major in her two, oddly paired passions: Musical Theatre and Political Science. She is more than grateful to be a part of this production, and to be a member of the High Street staff and family. MICHAEL KINGMAN (Greg Gardner) is elated to be portraying Gregory Gardner in A Chorus Line. Originally from Oregon, he is grateful that his journey has brought him the opportunity to perform alongside such a talented group of people. A recent graduate of Moorpark College, where he could be seen in productions such as Hair and Hairspray, he is soon transferring in order to pursue his BFA in Acting! MICHAEL KRONENBERG (Roy) is ecstatic to be back on the High Street Arts Center stage. You may have seen him recently in HSAC’s Footloose and in Conejo Players Theatre’s Hairspray. He attends Moorpark College, and in high school was a part of the award-winning Westlake High’s Vocal Ensemble, “A Class Act,” and show choirs. He’d like to thank his family for their endless love and support; his friends for believing in him; and High Street’s staff for the countless hours spent to make this show fantastic. Hope you enjoy the show! JULIANA LAMIA (Diana Morales) is thrilled to be playing Diana Morales in her first High Street Arts Center production! Past performances include The Little Mermaid (Ariel), The Outsiders (Ponyboy), Little Women: The Musical (Meg), and Steel Magnolias (Shelby). She wants to thank her dance teachers at CAPA, her incredible vocal teacher Becca Peyton, and her performing arts teachers at La Reina. This fall she will be attending Texas State University’s Musical Theatre BFA program! Much love and thanks to Mom, Dad, Nick, family, and friends! SAM MACHADO (Frank) is so excited to make his debut performance at High Street Arts Center. He was most recently seen in the ensemble of The Little Mermaid at the Simi Valley Cultural Arts Center. Previous productions include Side Show (Fakir), Farragut North (Ben), Fiddler on the Roof (Nachum), The Addams Family (Ancestor), and Brigadoon (Harry Beaton). He sends his gratitude to friends and family who have always supported his passion for the magic of theater. Enjoy the show! ISABELLA PHILLIPS (Vicki) is ecstatic to be returning to High Street Arts Center for her second show, after appearing in Footloose. Past credits include A Midsummer Night’s Dream (Helena), The Addams Family (Ancestor/Alice Beinike u/s), and ensemble in Actors’ Repertory Theatre of Simi’s productions of Les Misérables, Sweeney Todd, The Music Man, and more! She would like to thank the amazing production team and cast, as well as her family and friends for their never-ending love and support. ANNIE SHERMAN (Bebe Benzenheimer) is an L.A.- and Ventura County-based actor/singer/dancer. Favorite past credits include The Taming of the Shrew (Katherine), Hairspray (Velma Von Tussle), The Drowsy Chaperone (Janet van de Graaff; Four Star Theater Alliance Award for Lead Performance – Female), A Chorus Line (Val), Urinetown (Officer Lockstock), Thoroughly Modern Millie (Ethel Peas), and 11 different characters in Spamalot! She’s also performed in two seasons of Thousand Oaks’ Kingsmen Shakespeare Festival. MCKENNA TEDRICK (Maggie Winslow) is thrilled to back at High Street Arts Center! Favorite roles include Elle Woods in Legally Blonde, Ariel in Footloose, Amber Von Tussle in Hairspray, Wednesday in The Addams Family, Cindy Lou in The Marvelous Wonderettes, Teen Fiona in Shrek the Musical, and Violet in the world premiere of Hello! My Baby. Huge thanks to Chris, Megan, DJ and the rest of the production crew for the opportunity to be in this wonderful production! SAMUEL THACKER (Mike Costa) is thrilled to be onstage in this iconic show! Recent credits include professional tours in Peter Pan (Anchorage), and The Full Monty (Reno). Another favorite role, among almost 30 productions, was Tom in Tom Sawyer — right here at High Street Arts Center. He thanks Chris and the entire team and cast; his parents for always believing that he “can do that”; and his sister, Hannah, who is younger, still a dancer, unmarried, and definitely NOT fat! MICHAEL WORDEN (Al DeLuca) is very excited to be returning to High Street Arts Center, where he previously performed in A Few Good Men (Sam). National touring credits include Into the Woods (Jack) and Footloose (Chuck). Additional theater credits include A Streetcar Named Desire (Stanley Kowalski), Next to Normal (Dr. Fine/Madden), The Baker’s Wife (Barnaby), The Last Five Years (Jaime), and Crime of the Heart (Barnett Lloyd). Michael would like to thank the entire cast and crew for this wonderful experience, and Carly for her unwavering love and support.